02. 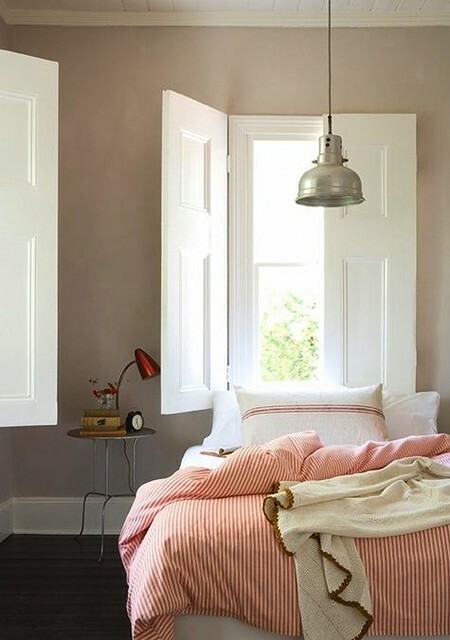 Love the grey + bright white and pops of color. 03. The red ticking + industrial pendant lamp are what I think make this room so rad. 04. Again with the dark wall + white bedding. And the chair. That color combo is perfect. Tomorrow I'll be posting an inspiration board that I've been working on while planning for the big bedroom redo. I'm a little apprehensive about doing so since I know little to nothing about interior design (or about putting together inspiration boards for that matter) so please be gentle. I'll also be posting pictures of our bedroom in its current state since you've all been so patiently waiting for pictures of the house. *please tell me you know that movie quote. Yes I remember "So I married an Axe Murderer". Good luck! Love your new design. :) Good job. Your blog is always so clean and organized looking. Very appealing. 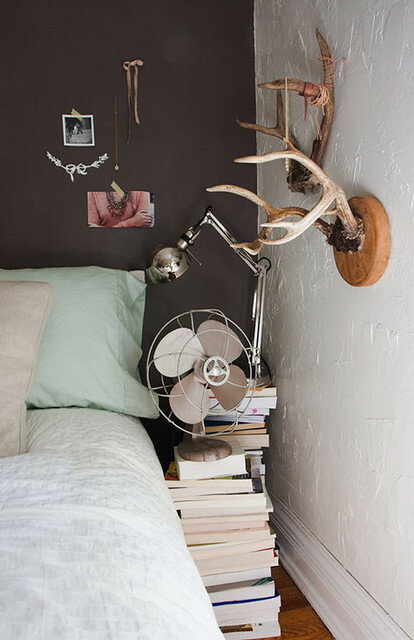 I love that industrial looking pendant lamp, and the cool reading lamp in the other photo. Also love all the white bedding, it looks clean and crisp....I just don't know how long it would stay that way at my house, but Zaly is not quite as terrible as my sweet daughters. Great inspiration photos, can't wait to see it come together! Very beautiful. We bought gray paint for our bedroom too. Am a little nervous about it, so I haven't painted yet. It doesn't exactly "match" my white+kelly green bedding. Your pictures are inspiring. Can't wait to see how your bedroom turns out!! I really like the dark/light contrast, too. In my townhouse in Payson I painted the walls in my bedroom dark blue and had mostly white bedding. That was before kids and a cat, though. Now are bedroom walls are dark (which is subliminally great in the summer heat), but our bedding is dark, too, so I miss the contrast. Subfloor can be your friend and enemy. They begin to think you can just varnish it and live with it like that!!! I love the idea of a dark wall and that first one looks almost deep, dark chocolate on my screen too! I am really getting the decorating itch at the minute so look forward to seeing how you get on. i looooove your room choices..i especially love grey and yellow. nice choices.